"I'm still stuck on trying to make people covet things." Virgil Abloh speaks in Helvetica. Universal and unemotional, that’s the sound of his voice you’re seeing when you read “keep off“ emblazoned on an Ikea rug, or “AIR“ on the soles of Nike Vapormax as they take off on the resale market. And if you’ve ever wondered whether there’s a deeper meaning behind it—what else can “Do Not Drop” evoke printed on a bottle of champagne?—the multihyphenate creative force sat down with Surface at The Mercer Hotel in SoHo, where he’s directed music videos for Lil Uzi Vert and A$AP Rocky, to discuss his latest collaboration with Moet. That’s something other champagne brands have done to their detriment at the height of their own successes. 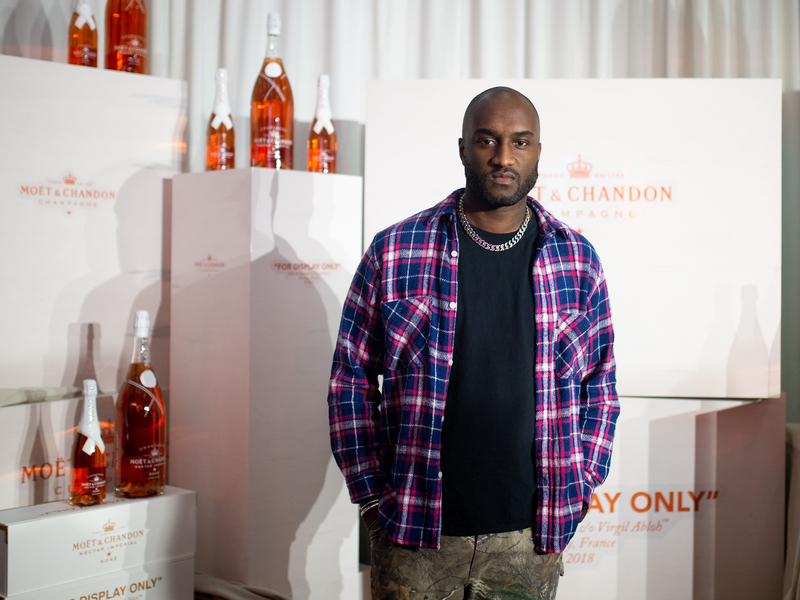 While the rap community devoted their lyrics and videos to promoting Cristal in the early 2000s, all that changed when, in 2006, the brand’s managing director Frederic Rouzzard was asked by The Economist how he felt about the champagne’s association with the “bling lifestyle.” He infamously responded: “What can we do? We can’t forbid people from buying it.” Overnight the yellow bottle lost its place in MTV rotation, was parodied on 30 Rock, and saw its unofficial ambassador Jay-Z pull the champagne from his clubs and took an ownership stake in a new brand, Armand de Brignac. After all, just because a collaboration is “with Virgil Abloh,” that doesn’t mean he has to display depth beyond the veneer of his name. He was just named as one of Time magazine‘s 100 Most Influential People; it’s clear he doesn’t need to give more of himself. So who’s to say that a $60 bottle of Moët isn’t as delicious as a $200 bottle of Cristal if it’s selling for as much on the aftermarket. You’d have to open it to find out.